4 Bedroom Detached House For Sale in Bedford for Offers Over £450,000. VILLAGE LOCATION 1700 SQ FT An extremely well presented four double bedroom detached family home located in the desirable village of Houghton Conquest. Accommodation briefly comprises of entrance hall, kitchen, utility room, cloakroom, 16ft dining room and a 18ft lounge. First floor comprises of four well proportioned double bedrooms the master benefiting from an ensuite and a separate four piece family bathroom servicing the other three bedrooms. 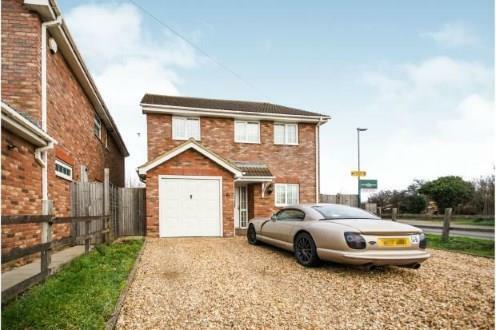 Further benefits include garage, off road parking and a generous size rear garden. Entered via double glazed front door with side light window, oak engineered oak wood flooring. Two piece suite with low level WC, wash hand basin and double glazed window to side. Fitted to comprise of wall and base units with roll top work surfaces, stainless steel sink and drainer, double oven, hob and extractor over, splash back tiles, built in dish washer, built in freezer and double glazed window to front. Integrated washing machine, integrated tumble dryer, base and wall units with roll top work surfaces over, double glazed door to side. Double glazed French doors to to rear garden. Double glazed French doors to rear garden, under stairs storage cupboard. Fitted to comprise three piece suite with low level WC, wash hand basin and shower enclosure, tiled flooring and part tiled walls. Three piece suite with low level WC, wash hand basin and panelled bath and shower enclosure. Up and over door, side window and power and light.